Our dog, Snowflake, investigates the offending machine the day after the near calamity. 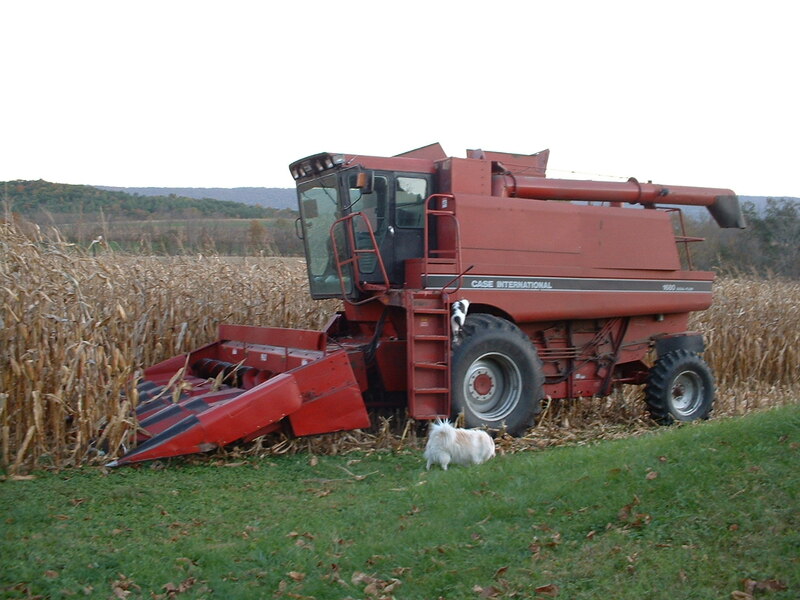 It was a beautiful Saturday in October 2006 when my mother called to sound the alarm, "get the cats in - they're cutting corn!" We were still traumatized by Ariel's death a few years earlier. She had been crouching in the field, too scared to run, when the hay mower ran over her. I come from a long line of cat-lovers. They are amazing creatures - extraordinary athletes, lovable, yet aloof, independent, yet cuddly, hilarious when they're serious, adorned in a myriad of colors and personalities. I don't have the heart to keep these curious creatures cooped up inside all day, so the field behind our house becomes their jungle. Now on this fine fall day, I had 4 cats to retrieve - Donnie & Marie, Flower and Sierra. I ran outside and desperately called them. Mom rushed over from next door and helped. One by one we got them in the house - Marie, Flower, Donnie... but no Sierra. I was amazed how fast the combine was moving, mowing down row after row of corn, each one closer. We grew more and more desperate calling, "SIERRA...KITTY, KITTY," and shaking bags of cat treats. I ran back and forth scanning the dwindling corn rows. Where was Sierra hiding? Mom and I watched in horror as the combine turned and started down the row directly behind my back yard! Then something astounding happened! The tractor came to a stop right in front of us! What in the world? Did the farmer see our frantic motions and stop to ask what was wrong? He climbed out of the cab and onto the combine, opened a hatch and looked inside, then turned to us and yelled, "IT'S ON FIRE, GET WATER!" Later, after the fire was out and the firefighters were stowing their gear, Mom and I surveyed the scene and I murmured, "it's a miracle." Was I wrong to take joy in this farmer's misfortune? Nobody was hurt, and the combine was running again in a few days. It's hard to feel sorry for the guy who killed my cat and routinely spreads manure during holiday cookouts. Plus he never thanked me for hauling buckets of water to him. In fact, he was downright grumpy about the whole thing. Postscript. Sierra eventually sauntered out of hiding when the commotion was over. In the intervening 5 years, Donnie, Flower, and Snowflake have all passed away, each one tenderly buried in the pet cemetery between our homes and mourned with many tears. Sierra and Miss Marie are alive and well, but don't like each other very much. However the 2 cats get along well with their new brother, Boomer, the yellow lab.